At SouthPack, we treat our customers’ products as if it was our own. 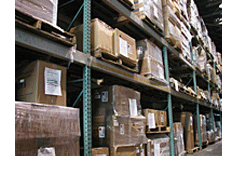 With over 400,000 square-feet of secure manufacturing and warehouse space at our disposal, SouthPack offers exceptional contract packaging and catalog fulfillment services with the flexibility of general storage of pallets, EDI distribution services, fulfillment, and full pallet programs for club store packaging. SouthPack offers contract assembly and subassembly services. Our catalog department will warehouse, pick, pack, process and ship your order to anywhere in the world, on a daily basis. And, our five-step quality assurance program assures we’ll get it done right. Using EDI, SouthPack provides customized inventory management for immediate turnaround–all with unparalleled customer service. JIT delivery options offer convenience and cost savings so you can easily coordinate with your retail outlets. SouthPack can meet all your warehousing, catalog fulfillment, inventory management, contract assembly and contract packaging needs, please call 888-SOUTH03, Ext. 16 (888-768-8403) now or contact SouthPack.